William A. (Bill) Murray, 87, of Dayton, Iowa, passed away on Tuesday, January 29, 2019 at Stratford Specialty Care. William Arnold Murray was born on June 1, 1931 at Emmetsburg, Iowa, the son of Glen and Hazel (McClelland) Murray. He was educated at the Cutting country school near Brushy Creek. Bill served in the United States Army 1952-1954 and was stationed in Germany. He was honorably discharged in October 1954. On July 8, 1952 Bill was united in marriage to Esther Knox at Madrid, IA. 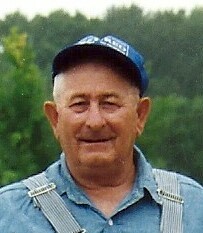 Bill was employed in several manufacturing, construction and farming positions during his lifetime and retired in 1993. Survivors include his wife, Esther Murray of Grandview Health Care Center in Dayton, IA, four sons, Marty Murray of Dayton, IA, Bill (Tracy) Murray of Dayton, IA, Harold Murray of Dayton, IA, Andy Murray of Lehigh, IA and three daughters, Sylvia (Darrell) Pigman of Lehigh, IA, Susan (Keith) Thompson of Mesa, AZ and Stephanie (Rod) Jones of Dayton, IA. Eighteen grandchildren, 27 great-grandchildren and 1 great-great grandchild. Brothers, Foncie Murray of Dayton, IA, Walt Murray of Duncombe, IA and Jerry (Nita) Murray of Lehigh, IA. Bill enjoyed hunting, fishing, visiting friends and family and his horses. In addition to his parents, William was also preceded in death by his sister Rosetta Tuel, brothers, Elmer, Pat, Gene and Larry and infant daughter Trudy.